TH E M R EP O RT | 47 O R I G I N AT I O N THE LATEST ORIGINATION THEFIVESTAR.COM FOR THE FIVE STAR'S MANY EXCITING EVENTS COMING IN 2018-2019. 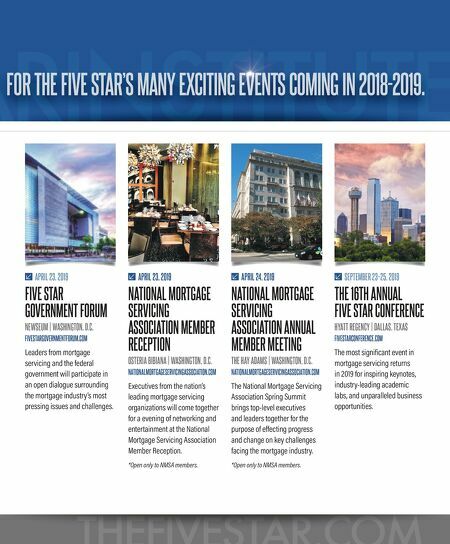 APRIL 23, 2019 FIVE STAR GOVERNMENT FORUM NEWSEUM | WASHINGTON, D.C. FIVESTARGOVERNMENTFORUM.COM Leaders from mortgage servicing and the federal government will participate in an open dialogue surrounding the mortgage industry's most pressing issues and challenges. APRIL 23, 2019 NATIONAL MORTGAGE SERVICING ASSOCIATION MEMBER RECEPTION OSTERIA BIBIANA | WASHINGTON, D.C. NATIONALMORTGAGESERVICINGASSOCIATION.COM Executives from the nation's leading mortgage servicing organizations will come together for a evening of networking and entertainment at the National Mortgage Servicing Association Member Reception. *Open only to NMSA members. APRIL 24, 2019 NATIONAL MORTGAGE SERVICING ASSOCIATION ANNUAL MEMBER MEETING THE HAY ADAMS | WASHINGTON, D.C. NATIONALMORTGAGESERVICINGASSOCIATION.COM The National Mortgage Servicing Association Spring Summit brings top-level executives and leaders together for the purpose of effecting progress and change on key challenges facing the mortgage industry. *Open only to NMSA members. 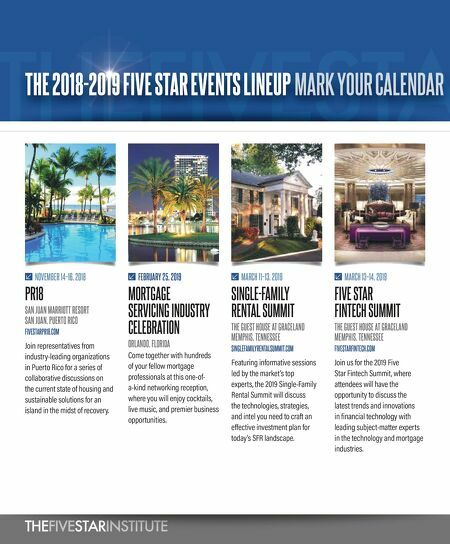 SEPTEMBER 23–25, 2019 THE 16TH ANNUAL FIVE STAR CONFERENCE HYATT REGENCY | DALLAS, TEXAS FIVESTARCONFERENCE.COM The most significant event in mortgage servicing returns in 2019 for inspiring keynotes, industry-leading academic labs, and unparalleled business opportunities.